With a sturdy hd construction, this ladder will make a handy addition to anyhome. When folded, it takes little space and can be placed easily. Our item isideal for you to access the hard to reach places in and around your home. This laddercomes with a tray to place your tools which makes it even more easier for youto work with. Notice: do not step on the tray! Storage Function Tool Box -- This Giantex step ladder has a tool box on the top of the handle, which gives the room to put the work stools and makes the work more convenient. Solid structure-- Four rubber pads on the bottom of four legs for safety using . The Heavy Duty 3 Step Ladder is structured for safety with good weight capacity, and 4 covers on the 4 legs could prevent hurting the floor. 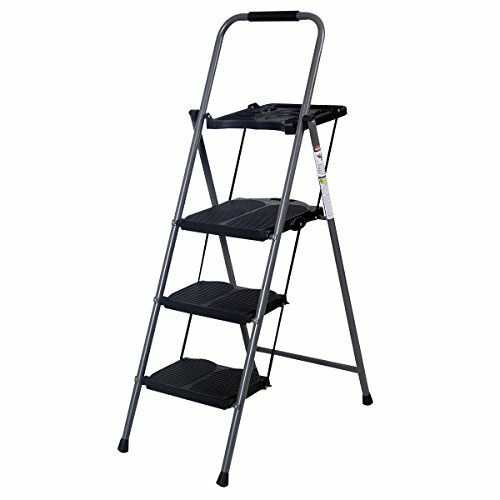 Large Platform and Anti-slip Steps: Strengthening treads, anti-slip steps and non-slip end caps keeps the step ladder gripped firmly on its feet. Multifunctional Usage-- It could be used at home, office, kitchen, basement . And you could use to fix the lamp, wipe the glass, do housework and decorate the house. Suitable for almost every fix work which needs the ladder. Foldable Design-- The foldable design is very convenient and would not take much room to storage. Easy to carry and easy to move. Large platform for comfortable and safe.